Visit the Chrissy D. Lobster Company. The captain and his deck-hand check the traps. 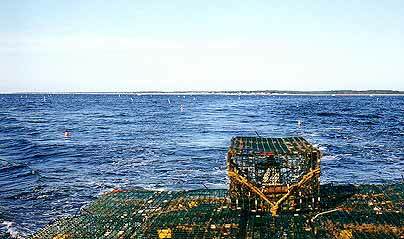 To the right is a seemingly unorganized mass of lines and buoys on the deck attached to the traps. When everything is layed up correctly, believe it or not, the lines play out just right. 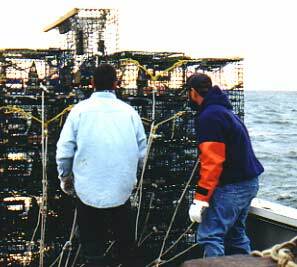 The traps are taken off the stack in sequence . The last trap to be layed is in the lower right hand corner of the stack. At that point the deck-hand (who has to get the trap on the opposite rail and drop it) is almost at a full run on a deck with lines on the way out. I've seen him do this on days we were running in 4-6 foot seas. A mistake would be bad. 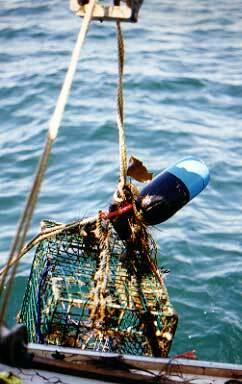 To the uninitiated (or inexperienced), setting traps in inshore water can appear to be a bit of a black art. 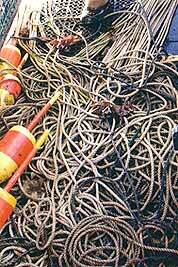 There can be so many trap lines in the water that you think you could walk to shore on the buoys. I've seen the captain immediately haul a line he had just set because he knew he had either missed his target spot or was laying over someone else's gear. Exactly how he knows this without x-ray vision is still a mystery to me. 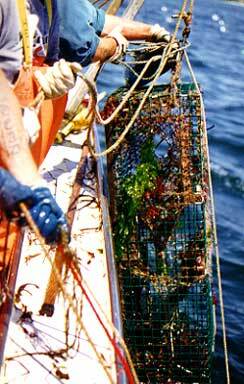 There are a number of things that cause trap lines to move into each other causing them to tangle, but in this case it was a matter of a less experienced lobsterman setting a trap line over ours and probably not realizing it. 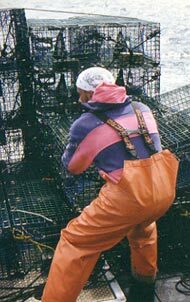 If the owner of the mislayed gear sees this page, he will recognize his buoy colors immediately - and so will other local lobstermen. There can be a lot of gear in the water during the milder months.